Chain blocks / manual hoist systems are also commonly known as a manual chain hoist, block and tackle, hand chain hoist, chain hoist, manual hoist or manual chain block. A chain block and tackle provides a convenient and versatile method to lift heavy loads. They are quick to fit, portable and cost effective, they are extremely useful for finer, accurate control of the load. A block & tackle is also very useful in areas where there isn’t any electric supply, or where using electrics could possibly be hazardous, e.g. chemical plants. A manual chain hoist or a block & tackle are frequently utilised in workshops, factories, the construction industry and many more. 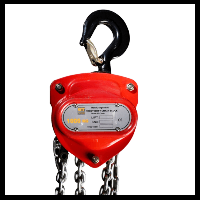 Most block & tackle / manual chain hoist systems are a low maintenance, easy to use piece of lifting equipment. They are attached to an appropriate fixing point with its top hook. This is usually to a beam clamp or trolley, Jib crane, mobile gantry system or overhead crane. The load is then attached on the lower hook. Once the chain block & tackle is suitably hung then the load to be lifted may be attached to the bottom hook on the end of the chain. When securely attached the operator can begin to pull down on one side of the chain. This should be done slowly at first to allow you to check the stability of the load once it is lifted clear of the ground. (an unstable load can cause severe injuries). The chain rotates around two gears inside the housing; this multiplies the force caused by the gear ratio to lift the load. A chain hoist will usually have a brake system to then hold the load in position, whilst manoeuvring to its final resting place. Most modern day chain blocks will have an overload prevention device fitted for extra safety. A chain block may also be supplied with a chain bag/bucket which can be extremely useful, as they not only keep the surplus chain out of the way, and stop people from tripping; they also protect the chain from damage. 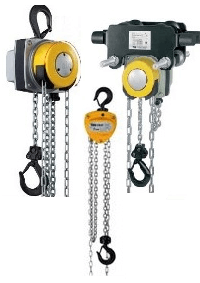 Chain Hoists – Chain Blocks are available in various forms with differing lifting capacities. Lifting Hoists Direct offer an extensive range from all the top manufacturers at very competitive prices. We can supply various models with capacities from 500kg up to 20’000kgs. Some varieties of these chain blocks come with an integrated trolley for convenience, and there is also the popular 360 degree chain block which allows full rotation to enable the user to work in nearly all positions, even above the load. We can also supply Atex rated manual chain hoists – chain blocks for hazardous environments, see our Atex rated hoists page; and sub-sea chain hoists for the marine industry. The most commonly used manual hoists have 1 fall of chain to lift and lower the load. This is the lightest and fastest to use, however chain blocks are available with different falls of chain, i.e. two or four. They work exactly the same but the extra falls enable the hoist to lift heavier loads however are much slower as there is more chain to be pulled through more gears. The chain can be any length but usually come with 3 meters height of lift as standard. There are many safety guidelines for the safe use of any type of lifting equipment these should always be issued with your equipment. Here are the very basic do’s and don’ts for a manual hoist. block and tackle system / chain blocks. Exceed the safe working load which should be clearly marked on the chain block and tackle; use if defects are noticed or problems suspected; stand under a suspended load; tip the load; replace the chain without consultation with the supplier/manufacturer; lift people. Check over the block & tackle for defects before each use; ensure it is regularly inspected by a qualified person (6 monthly); use appropriate safe slinging methods; pull chain smoothly; ensure the chain/bottom hook will reach the lowest point without running out the chain completely; attach load directly beneath top hook, keeping the centre of gravity as closely as possible. "Recieved my chain block within 2 days, I bought the cheapest option which more than caters for the job i need it for, will last many years. 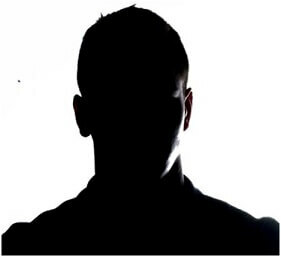 Very impressed with this company, easy to deal with. "